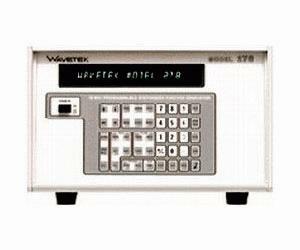 The Wavetek 278 Synthesized Function Generator is a half-rack instrument for bench or ATE use. Waveforms: sine, triangle, square, pulse, and external width controlled waveforms from 0.01 to 10 Vp-p, and dc offsets within a -5 to +5V range into 50-ohms. Waveforms can be continuous, gated or triggered. Frequency range or 0.01Hz to 12MHz with a synthesized accuracy or 0.0005%. Volatile memory for 40 stored settings.